One of my goals this winter is to make more soups. My secondary goal is to get my 3 year old to try one of my soups sometime, alas, we have yet to accomplish that goal (we’ve made lots of Nutella sandwiches for him). Lentil soup is new to me. Actually, lentils in general are new to me, but I really liked them. Lentils are found alongside the dried beans in the grocery store. But, unlike the dried bean, lentils do not need to be soaked overnight (bonus!) Lentils are a wonderful source of fiber and are naturally fat free so these are great if you are watching what you eat. The lentil soup, with its beef broth and tomato base and all the veggies reminded me of a nice minestrone. It was a nice cozy meal last week when the high temperature here was -15. No that’s not a typo, 15 degrees below zero was the high temperature last week (for several days) with windchills in the negative 40’s. Brrrrrr…..I think I need more soup! In a large soup pot, heat olive oil over medium heat. Add onions, carrots, celery, garlic, thyme, salt, and pepper. Cover pot and turn heat to medium low. Stir occasionally until vegetables are tender, about 15 minutes. 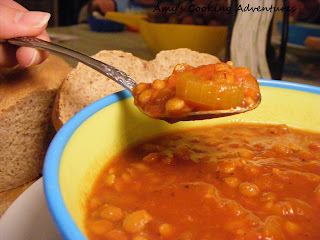 Once the vegetables are tender, add the tomatoes, stock, orange puree, and lentils. 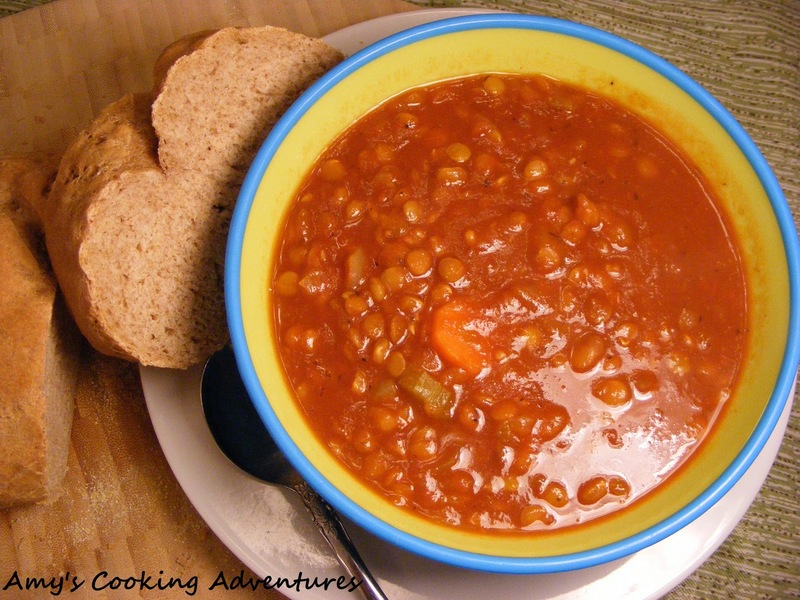 Bring soup to a boil; then reduce heat to simmer until lentils are tender; 30-40 minutes. Serve with crackers or whole wheat bread.